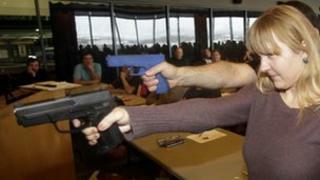 The US state of South Dakota has enacted a law allowing school districts to arm teachers and other school staff. The law's backers say it will prevent mass school shootings like a December massacre in Connecticut that killed 26. Amid a push by the White House to strengthen gun laws, the bill reflects a growing divide in the US over whether more or fewer guns keep people safe. The measure does not force school districts to arm teachers and will not require teachers to carry guns. But it allows each school district to choose if staff could be armed. It takes effect in July. Under the Republican-sponsored bill, school staff given permission to carry firearms on campus will be known as "school sentinels". The state has given a law enforcement commission the task of establishing a training programme for the sentinels. Several representatives of school boards, teachers and other staff spoke against the bill in legislative hearings, arguing guns would make schools more dangerous. But sponsor Representative Scott Craig said this week had heard from a number of school officials who back it. Mr Craig said rural districts do not have the money to hire full-time police officers.